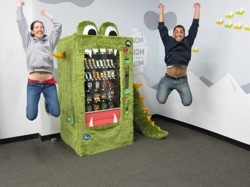 My friend and I took an old, used vending machine and transformed it into the happiest, healthiest thing we could imagine. We named him the Goodie Monster and he’s about to have a family. He’s been accepted by Kickstarter and we’re going to kick off a campaign in about a month. The goal is to raise enough money to give him a mom, dad, sister, and brother. Last summer, I realized vending machines were awesome. Yes they are full of junk, and ugly, and hidden away in buildings. But why not full of good food, and fun, and out in the open for everyone to enjoy? So I approached fellow snacker and designer extraordinaire, Mette Hornung Rankin of the Bureau of Betterment, and she was as excited as me. And so the hunt for a used vending machine began — “used” being the key word. Why not make the most of what we already have? After weeks of searching, I finally found him — an old SnackShop4000 to be exact — and our building owner let us keep him in an empty art gallery. It was time to buy a lot of fake fur. The Goodie Monster serves good snacks. What is good? Snacks as tasty, healthy, local, organic, affordable, and lovingly-made as possible. They include Justin’s Nut Butters, KIND bars, CLIF bars, LUNA bars, Sahale nut mixes, Food Should Taste Good sweet potato chips, Popchips, Pirate’s Booty, 479 popcorn, dried fruits, and trail mix. They’re snacks that taste great, and then taste even better once you hear the story of who made them and why. To top it off, they’re all about two bucks or less.